UK new car sales have nosedived. Even sales for September – the most crucial month of the year as new numberplates come in – were down a staggering 20.5% versus 2017. A perfect storm has erupted with many factors to blame, but perhaps the most significant is an EU regulation that came in on the 1 September. By that date, all new cars in Europe can only be sold if they’ve undergone a new test – WLTP (worldwide harmonized light vehicles test procedure). This aims to strengthen EU standards for CO2 emissions and mpg, following the Dieselgate crisis. New generations of cars released after 1 September last year (and those with significant facelifts) have already been put through the WLTP. Since 1 September, the rest of the existing lineup has to have gone through these tests. Months later, it is still causing gridlock at car testing centres across the EU – with the issue now being felt by consumers. This delay in cars being certified for sale means some buyers are suffering ever-longer waiting times before their cars are actually delivered. Looking for a reliable car with great mpg? Our independent tests reveal the best cars for 2018. September is the most important month of the year for car sales, as it’s when new number plates are introduced. As you can see from the graph below, new car sales have sharply declined in September this year. There are a limited number of WLTP testing centres across Europe. Even before WLTP, these testing centres typically operated at or near capacity. Now all manufacturers are desperately putting their entire car ranges through for certification. This has caused a massive backlog at testing centres across Europe. We’ve heard from Which? members who have told us about delivery delays and production suspensions for new cars. Manufacturers that sent their models to testing centres later, and therefore are later in the queue, are more likely to be adversely affected. Some that planned ahead haven’t been affected at all. Car manufacturers with bigger product ranges and larger numbers of variants of each car have typically been the worst affected, since they have enormous numbers of cars that have to undergo certification at the same time. To further complicate matters, the WLTP isn’t the only emissions test that new cars have to go through. All brand new generations of cars released after 1 September 2017 have had to go through another test, called the Real Driving Emissions (RDE) test. All other new cars will have to be RDE tested from 1 September 2019. The WLTP measures CO2 and mpg. 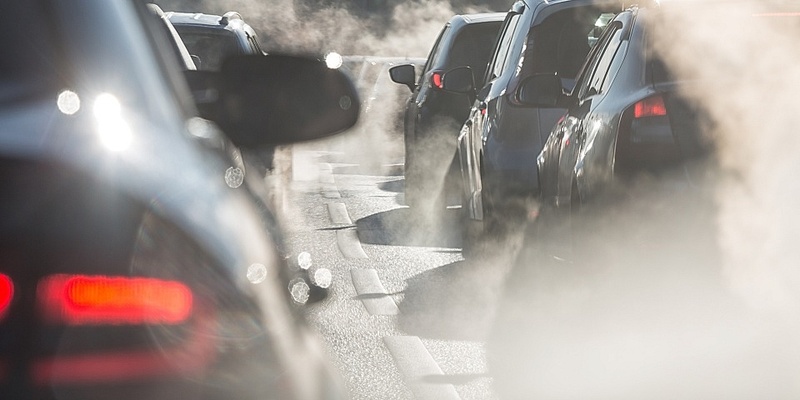 The RDE aims to replicate levels of NOx (oxides of nitrogen) and PN (Particulate Number) emissions that will actually be produced by drivers out on the road. Unlike the WLTP, which takes place in a lab, RDE tests take place on the road. It’s potentially having an effect on car sales, too. Nick Molden from Emissions Analytics, an independent global testing specialist, said: ‘Manufacturers knew about WLTP long ago. The WLTP delays are more to do with the repercussions of Dieselgate and the new RDE tests than the WLTP itself. When will UK car sales be back to normal? How long this backlog will last is unclear, with some manufacturers likely to be affected worse and for longer than others. One source told Which? they expected to see at least some improvement by the end of the year. It’s also unclear how much these new tests are to blame for the decline in UK car sales, and how much is due to other factors – with a series of pressures having developed this year. 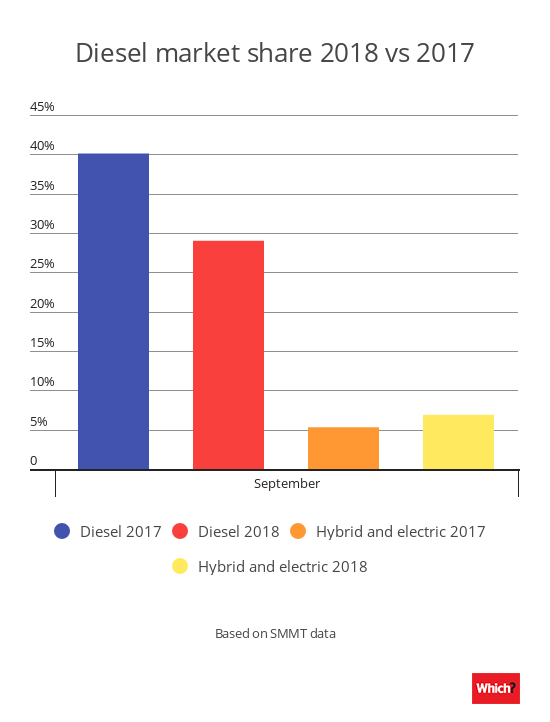 Car trade body the Society of Motor Manufacturers and Traders (SMMT) puts the upheaval down to confusion over diesel policy and changes to Vehicle Excise Duty, as well as the backlog in testing caused by the WLTP. Diesel sales, in particular, have suffered the most. 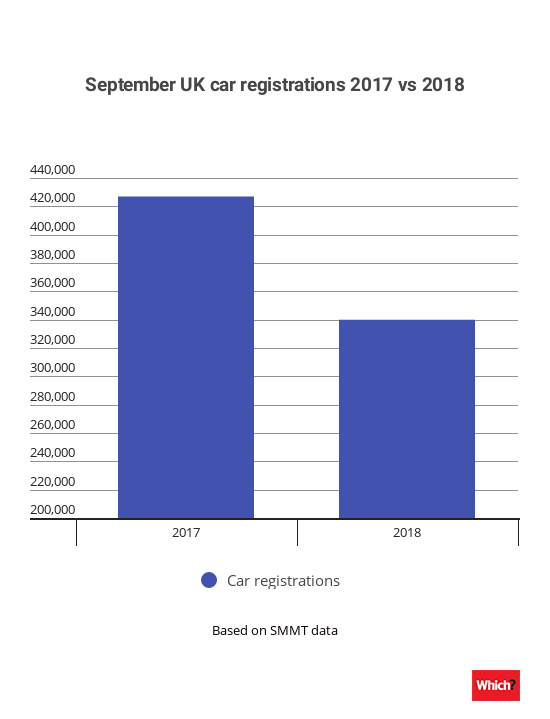 This is starkly shown in SMMT car registration figures, with diesel car registrations having a 40.1% market share in September 2017, but only 29.0% in September this year. Conversely, out of all the fuel types, hybrid and electric vehicle sales are growing the fastest. However, the number of hybrid and electric cars being sold is only a tiny faction of total car sales. 23,507 hybrid and electric vehicles – less than 7% of total sales. Want to know if a hybrid car is for you? See our expert pick of the best hybrid cars. What mpg and emissions figures can I trust? The new WLTP and RDE tests are a positive step forward that will produce more efficient, less polluting cars. But they are still not as rigorous as Which? car tests. The new RDE tests initially allow a conformity factor of 2.1, which means manufacturers are allowed to exceed more than triple the official limit. In 2020, this factor is changed to 0.5, meaning cars will still be able to exceed official emissions limits by more than 50%. We independently test emissions so you can be sure what your car is really emitting. We run the WLTP cycle for each car using both a ‘cold cycle’, where the engine is cold, and a ‘hot cycle’, where the engine is already warm to test the engine under the the varying conditions you’ll find when driving. We also use a motorway driving cycle, which catches out a lot of cars that are efficient at low speeds but burn a lot of fuel when on the motorway. And finally, we set up the cars the way you use them – with air conditioning turned on, lights on dipped beam and the radio playing. We don’t turn everything down and use ‘eco’ engine modes, so you know exactly how a car will perform when driven normally. For realistic mpg and emissions figures you can trust, check out our new and used car reviews.